Portugal won the UEFA European football championship for the first time, following a 1–0 victory after extra time over the host team, France, in the final played at the Stade de France, in Paris. The only goal for the Portugal team was scored by Eder at 109 minute in the 11 minutes of extra time. 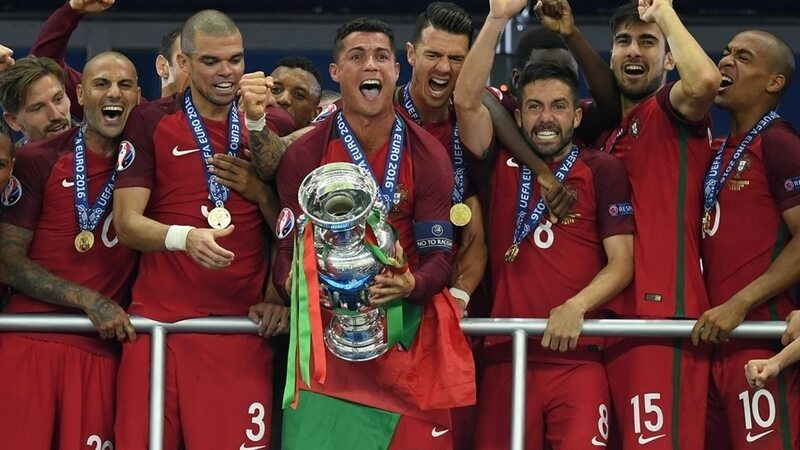 With this victory, Portugal has earned the right to compete at the 2017 FIFA Confederations Cup hosted by Russia. Youngest Player of the Tournament: Renato Sanches (Portugal) – aged 18. UEFA Euro 2016 was the 15th edition of UEFA European Championship, the quadrennial international men's football championship of Europe organised by UEFA. It was held in France from 10 June to 10 July 2016. France was chosen as the host nation on 28 May 2010, after a bidding process in which they beat Italy and Turkey for the right to host the 2016 finals. he matches were played in ten stadiums in ten cities. For the first time, the European Championship final tournament was being contested by 24 teams, having been expanded from the 16-team format used since 1996. Under this new format, the finalists contest a group stage consisting of six groups of four teams, followed by a knockout phase including three rounds and the final.